Chalk up another season in the books. I decided to stay close to home and fished the Rock. It was going to be a bluebird day and this night owl was going to get an early head start. The Rock was running the same consistency as a bottle of Grey Goose. I was out of eggs and that meant using egg flies, beads and shiners. It was the shiners did paid out in huge dividends. I had a good morning hitting drop backs out of several pools. Upstream, I could see the latest crew gleaning the redds. I've never understood the appeal of flossing. Due to the nice weather, a lot of people were out including the game warden. He was hitting every hole asking for fishing licences. Too bad he couldn't issue citations for blatant snagging. I was surprised he wasn't on the East Branch or down at the boat ramps picking on the Russians. He was a young warden fresh out of school. Most graduates end up in Cuyahoga County. The county has over a million people. Due to the sheer number of people and there is practically no hunting. The Rocky is the only steelhead river within the county. The Cuyahoga River gets strays but not a lot of people fish it. For a game warden, Cuyahoga County is dudsville. Time is spend gaining valuable experience and in time, they jump at the opportunity of working in a rural county. We exchange pleasantries and I produce my licence. He asks if there anybody else downstream and I say no. He thanks me and heads back up. The crew upstream watches him. If there was one word to describe the past season it would be - excellent. But that's my opinion and I'm sure a lot didn't share that sentiment. Last summer wasn't hot as my A/C took a rare summer off. The lake barely crept into the 70s and the month of September was cool and wet. 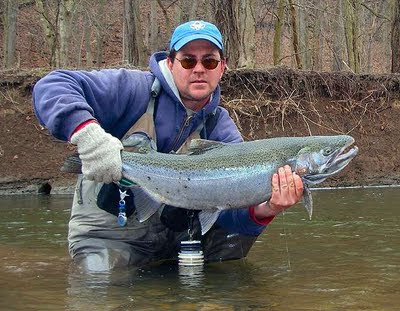 A little birdie told me that fish were being caught on the lower Conneaut, Elk and Walnut after Labor Day. That secret information was passed onto me and I kept it under wraps for the entire month. I racked up the mileage and prowling the Alley. October was a smoking month and the Conneaut was on fire. The double digits days were the norm. I pretty well fish the Connie and the Elk whenever the creek blew out. Both times on the Elk, I hammered fish and piled up some impressive stats. Towards the end of the month, I needed to change of scenery. For November, I ditched the Connie for the Grand ole girl. The Grand has a special place in my heart. It's huge, challenging and a pinner's dream. It will always be my favorite river. On July 28th 2006, the Grand made national news as 10" of rain fell in 24 hours. The Grand went 11' above flood stage. Homes along the lower section were overwhelmed with water as many were forced from their homes during the night. Boats at the marina were ripped from their moorings and many were washed out into the lake. It ended up being the 500 year flood and I've never seen the river go that high. Many speculated that the flooding would drastically alter it. But, the river didn't really change that much. Me and others were somewhat surprised and relieved. Most of the pools were intact and none of the gravel beds were washed away. I camped out on the Grand for the entire month. Both December and January were very mild months. The number of fish kept it interesting, but one river had disappointing numbers of fish. The Chagrin was a tough one to figure out. Most of my money spots really didn't produced. The numbers were way off from a year ago. Then the bottom fell out in February as it was the one of the coldest in recent memory. The rivers quickly froze up and shut down the fishing well into March. Time was spent down at the power plant dealing with those miserable little grebes that stole shiners off my hook. Once the ice was gone the fishing started to pick up once again. Luckily my home river started to get a consistent run of fish. April was an odd month, it started off mild and I remember taking off one Monday when the temperature was 70F. It was the beginning of the great push of fish up the Rocky. But, then the weather started to get cold. During the Easter weekend, we received nearly 3' of snow and it was bitterly cold. But, the fishing was on fire as a lot of fish starting pulling off the gravel and heading back into deeper water. Since the Rock is a magnet for flossers, I didn't have a problem catching droppies. It was a droppie fest for the next couple of weeks until I call it a season on the last week of the month.